intelligence and security services, but also abuses of those services by the Office of the president. The Church Committee investigated suspected abuses of power by the intelligence community by interviewing hundreds of witnesses and subpoenaing thousands of relevant documents and materials. The main targets of its investigations were the CIA, FBI, National Security Agency (NSA), and Internal Revenue Service (IRS). The committee also closely noted the involvement of the executive branch and President in intelligence affairs. In 1975 and 1976, the Church Committee issued fourteen reports. Report topics ranged from intelligence and executive branch involvement in the assassination of foreign leaders, an act prohibited by international law, to domestic espionage and political blackmail. Though the committee was initially charged with discovering the abuses of power and intelligence resources that contributed to the Watergate scandal, its investigations encompassed intelligence community operations during the entire post-World War II and Vietnam War era. The Church Committee issued its final report in April 1976. The Committee concluded that the CIA, FBI, and other intelligence forces, had conducted concerted campaigns of domestic espionage that threatened the Constitutional rights of ordinary citizens. The Church Committee further decided that such actions could be prevented by the establishment of a permanent means of congressional review for the intelligence community. The Senate created the Senate Select Committee on Intelligence, a modified version of the Church Committee, as an oversight and investagatory committee for the nation's intelligence services. In the 1970s and 1980s, the committee formalized the review and oversight process, and clearly defined instances of abuse of power and illegal activities that warrant committee investigation. The Senate Select Committee on Intelligence continues to operate today. Kurland, Philip B. Watergate and the Constitution (The William R. Kenan, Jr., Inaugural Lectures). Chicago:University of Chicago Press, 1978. United States National Archives and Records Administration. Watergate resources. 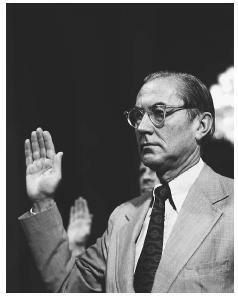 < http://www.archives.gov/digital_classroom/lessons/watergate_and_constitu ion/teaching_activities.html > (01 December 2002).